I think this is going to be the summer of popsicles for me. It might have something to do with the Florida humidity, or at least that’s my excuse. The latest batch I made are these Coconut Mango Lime Popsicles and I just can’t get enough of them! We ate up all the Fruit Smoothie Popsicles and it was time for a new batch of popsicles to keep in the freezer. You know what I love about popsicles? They have built in portion control. For a girl like me that loves ALL frozen treats (especially ice cream), that’s a good thing. I could seriously eat several of these coconut mango lime popsicles throughout the day if I wasn’t careful. They’re sweet, coconut-y, a little tart with a hint of mango. The thing to remember about making popsicles is you need to make them sweeter than you think. Once the mixture is frozen it doesn’t taste as sweet as it does right out of the blender. I used frozen mango chunks this time around and they weren’t as sweet as I would have liked so I used more cream of coconut (the sweetened coconut stuff used in Pina Coladas). If you have really sweet mangos you could probably cut back on the amount of cream of coconut. * If you use fresh mangos and they're really sweet try adding just a ½ cup of the cream of coconut and taste to make sure it's sweet enough. I put a few diced pieces of mango in the bottom of a couple popsicle molds prior to filling them, you can do that too if you want but it's not necessary. I use this type of popsicle mold (affiliate link) but you can use any type you like. Seriously! I made the exact same Popsicle this weekend to post later this week-haha! Your pictures look so much better. I think I’m going to have to make more to do a re-shoot. Ha! That’s funny…we think alike! I’m sure yours are beautiful! But if you do make them again try adding a little rum and tell me what they’re like 😉 – that’s what I’m doing next time! I just made my first batch of popsicles last week! I love that they can be both delicious and healthy and you are totally right about that portion control. I plan to make many more popsicles this summer and this flavor combo will definitely be on the list! These look AMAZING! I see a batch in my freezer in the very near future…perfection. These look so good and so refreshing. I can almost taste them! Love the flavors in these! And your photos, they’re gorgeous! It is a good flavor combination… Thanks! These popsicles are bursting with tropical deliciousness! Pinned to try later! Oh yea…. These will be happening here! 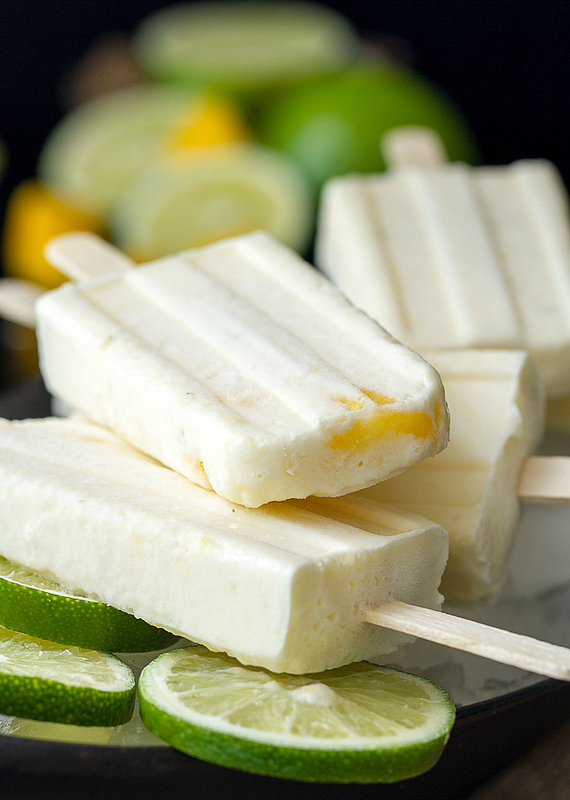 I love all things coconut, these popsicles sound amazing! These look fantastic! Love the photos! How summer-worthy! 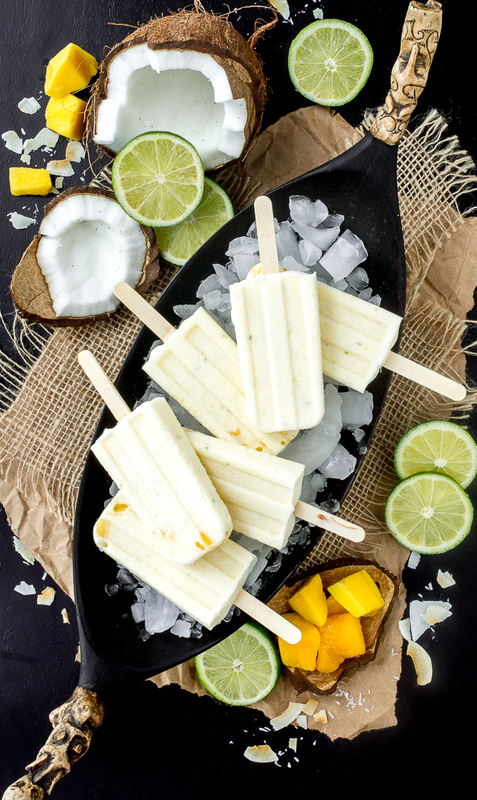 These popsicles look incredible and I bet taste delicious too.. the coconut, mango and lime combination is perfect. Would you mind measuring the lime juice please. We have small and bigger limes here. Thank you. Ok, next time I will… but for now I’d suggest to not really worry about it. A little more or less isn’t going to matter too much… I recommend tasting it and see if you like it. Go a little lighter and you can add more if it needs a little more sour, or add a bit more of the cream of coconut if you want it sweeter.